Alexa Chung addresses fans at Madewell on Newbury Street. On a drizzly Friday night, fashionistas filled Newbury Street to catch a glimpse of a true style icon: Alexa Chung. This British model and television host arrived in Boston to debut her latest collection for Madewell. Founded as a “workwear” company in 1937, this Massachusetts based brand is known for its high quality products, especially denim. Chung’s newest line, which appeared in stores and online September 22nd, is the second that she has produced for the company, a testament to her love of the brand. To promote her collection, Ms. Chung traveled to Madewell stores all over the country to meet and greet her fans. As a fan of both the Madewell aesthetic and Alexa Chung herself, I jumped at the opportunity to meet her. Along with two of my trendy friends, I waited eagerly in line to have my shot at an interview. Finally, our moment had arrived, and we were standing face-to-face with a legend. When I told her I was from The Daily Free Press, Chung jokingly begged, “Be kind! Be kind!” However, one glance at her work, and it was impossible not to fall in love with every piece in her line. Immediately, I knew I had one shot at a “hard-hitting” question. “Alexa, what inspired your new collection?” She was quite forthcoming with her response. “I was inspired by the 50’s, 60’s, 70’s,” she said, “what I would want to wear myself.” We quickly grabbed a group picture with Ms. Chung and were swallowed by a massive mob of Alexa fans. Luckily, we were able to stay in the store to shop and enjoy free manicures, upbeat music, food, drink and a mini flipbook photo shoot. 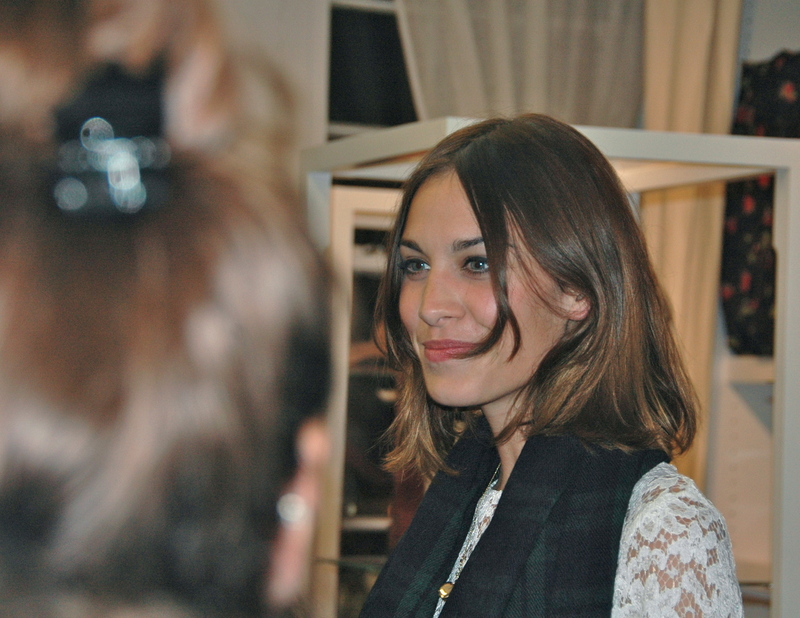 After the crowds subsided, we were able to get a second chance to talk with Alexa Chung. Again, we waited patiently in line as she spoke with other fans, danced around to the music and shared her thoughts about her collection. After chatting with the DJ about her favorite bands, she noticed that we were standing at the front of the line, awaiting another intimate chat. “Oh, are you guys in line?” she asked, British accent in full force, “Come on in. Enjoy!” as if she was inviting us in for a cup of tea. After receiving autographs on our mini flipbooks, we got down to business. When questioned about her favorite piece in the collection, she responded properly, claiming that she loves them all. In asking how she got into the fashion industry, we dove into the life of a “lucky, relatable” girl. Having been so grossly engaged, it was difficult to tear us away and allow other fans the same opportunity to enjoy Alexa Chung in all of her glory. We snapped our final individual pictures with her and then took off down Newbury to enjoy a relaxing dinner. Overall, it was a magical night that provided us not only with an up-close glance at Madewell’s newest line but also an in-depth look into the life of our generation’s most “relatable” fashion icon.